Researchers at Carnegie Mellon University and Yale University have, for the first time, used a gene editing technique to successfully cure a genetic condition in utero in a mouse model. Their findings, published online on June 26, 2018 in Nature Communications, present a promising new avenue for research into treating genetic conditions during fetal development. The open-access article is titled “In Utero Nanoparticle Delivery for Site-Specific Genome Editing.” An estimated 8 million children are born each year with severe genetic disorders or birth defects. Genetic conditions can often be detected during pregnancy using amniocentesis, but there are no treatment options to correct these genetic conditions before birth. “Early in embryonic development, there are a lot of stem cells dividing at a rapid pace. If we can go in and correct a genetic mutation early on, we could dramatically reduce the impact the mutation has on fetal development or even cure the condition,” said Danith Ly, PhD, Professor of Chemistry in Carnegie Mellon’s Mellon College of Science. In this study, the researchers used a peptide nucleic acid-based gene editing technique (https://www.cmu.edu/mcs/news-events/2016/1026-Gene-Editing-PNA.html) that they had previously used to cure beta thalassemia, a genetic blood disorder that results in the reduced production of hemoglobin, in adult mice, using intravenous administration of the PNAs. Peptide nucleic acids (PNAs) are synthetic molecules that combine a synthetic protein backbone with the nucleobases found in DNA and RNA. The PNAs used in this study were created by Dr. Ly at Carnegie Mellon’s Center for Nucleic Acids Science and Technology (CNAST), a leading center for PNA science. 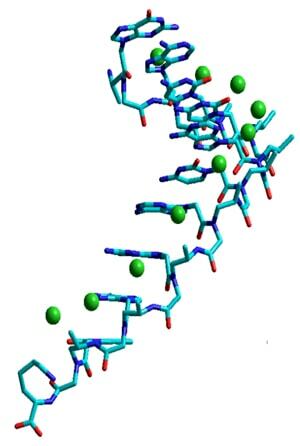 Their technique uses an FDA-approved nanoparticle to deliver PNA molecules paired with donor DNA to the site of a genetic mutation. When the PNA-DNA complex identifies a designated mutation, the PNA molecule binds to the DNA and unzips its two strands. The donor DNA binds with the faulty DNA and spurs the cell’s DNA repair pathways into action, allowing them to correct the error. In the current study, the researchers used a technique similar to amniocentesis to inject the PNA complex into the amniotic fluid of pregnant mice whose fetuses carried a mutation in the beta-globin gene that causes beta thalassemia. With just one injection of the PNA during gestation, the researchers were able to correct 6 percent of the mutations. This 6 percent correction was enough to cause dramatic improvements in the mice’s symptoms of beta thalassemia ¬– and enough for the mice to be considered cured. Mice that were treated using PNA while in utero had levels of hemoglobin that were within the normal range, less spleen enlargement, and increased survival rates. The researchers also noted that there were no off-target effects from the treatment, a finding that might suggest this method would be preferable over other gene-editing techniques like CRISPR/Cas9, which can erroneously damage off-target DNA. “CRISPR is much easier to use, which makes it ideal for laboratory research. But the off-site errors make it less useful for therapeutics,” said Dr. Ly. This work was made possible by the support of the DSF Charitable Foundation, who has donated $7 million to CNAST, enabling the center to engage in fundamental research aimed at developing synthetic chemistry solutions for the diagnosis and treatment of disease. Additional study authors include Adele S. Ricciardi, Raman Bahal, James S. Farrelly, Elias Quijano, Anthony H. Bianci, Valerie L. Luks, Rachel Putman, Francesc Lopez-Giraldez, Suleyman Coskun, Eric Song, Yanfeng Liu, David H. Stitelman, Peter M. Glazer and W. Mark Saltzman from Yale, and Wei-Che Hsieh from Carnegie Mellon. The research was funded by the Brain Research Foundation Scientific Innovations Award, the NIGMS Medical Scientist Training Program (GM07205), the National Heart, Lung and Blood Institute (HL134252), the Ohse Research Grant, Yale School of Medicine, the American Pediatric Surgical Association Foundation Grant, and the DSF Charitable Foundation. The Carnegie Mellon release was written by Jocelyn Duffy.